Lee H. MacDonald is in the Department of Forestry and Resource Management at the University of California, Berkeley, California, USA. The arid and semi-arid lands together constitute about one third of the earth's land surface but support only about one-eighth of its population. These dry lands contain a significant proportion of the poorest countries of the world. The United Nations University Arid Lands Sub-programme chose the theme "Assessment of the Application of Existing Knowledge to Arid Lands Problems". A number of research studies were commissioned under this theme, examining the various interfaces that exist between scientific investigation and the application of its findings, often within a regional context. 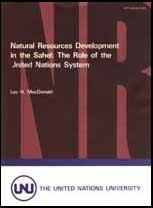 The study Natural Resources Development in the Sahel: The Role of the United Nations System also focuses on the problems of socio-economic development, environmental conservation, and the application of scientific knowledge and technological resources in the Sahel. In this it follows the views expressed by the UN Conference on Desertification (UNCOD, Nairobi, 1977), which provides a good example of the difficulties of follow-up co-ordination on the international level. The author's conclusion is that development aid must be provided in a spirit of co-operation and without any preconceived ideas. Although the UNU's special subprograms on Arid Lands has now been concluded, the new programme on Resource Policy and Management has undertaken to maintain this international dimension in research, training, and dissemination, stressing the interaction of resource management, conservation, and development. The views expressed in this publication are those of the author and do not necessarily reflect the views of the United Nations University.